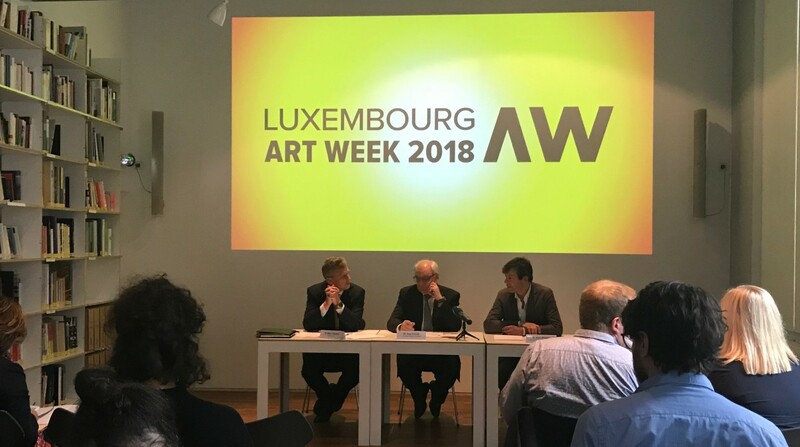 First press conference presenting the results of Luxembourg Art Week 2017 as well as key information and news of Luxembourg Art Week 2018, the CAL fall salon and other cultural events associated to the art fair (conferences, Art Talks, Kids Corner, ...). CONFERENCE | Is the art market overheating? Is the art market overheating? In 2017, Georgina Adam published Dark Side of the Boom: The Excesses of the Art Market in the 21st Century, in which she exposed the hidden facets of the international art market. Since then, prices for historic and contemporary art have continued to rise, as evidenced by the record sale of the controversial Salvator mundi attributed to Leonardo da Vinci. The art market – a bubble that is bound to burst? Accompanying the publication of the 2018/2019 edition of DADADA magazine, Maison Moderne and Casino Luxembourg are hosting the programme of Art Talks at LUXEMBOURG ART WEEK. Every day between 13:00 and 13:45, Luxembourgish artists and/or other actors from the local scene are invited to exchange their views on a given topic. Berlin is probably not only the most renowned and dynamic art scene in Europe today, but also the most diverse. The exhibition Class Trip presents several young artists from this scene, including Mary-Audrey Ramirez (b. 1990 in Luxembourg), who graduated as Meisterschüler of Professor Thomas Zipp at the Berlin Universität der Künste in 2016, and Vince Tillotson (b. 1989 in Luxembourg), who also graduated as Meisterschüler of Professor Thomas Zipp at the Berlin Universität der Künste in 2017 and has been a board member of Schwules Museum Berlin since 2016. Class Trip is curated by Casey Detrow (b. 1988 in the USA; lives and works in Luxembourg and Berlin). Detrow’s curatorial approach is informed by feminist theories and Marxist feminism, which centre on a critical analysis of society from the perspective of gender, race and class, and their impact on everyday life. Casino Luxembourg’s new ArtBookBox bookstore stocks a selection of contemporary publications on contemporary art, from books and monographs of Luxembourgish artists to catalogues, essays and editions by Casino Luxembourg. For the past three years, Casino Luxembourg has been actively involved in LUXEMBOURG ART WEEK, among others through its series of Art Talks and its ArtBookBox. To strengthen its commitment and contribute to the fair's prospecting process, Casino will for the first time this year present an exhibition in its booth at the entrance of Halle Victor Hugo. The starting points of Class Trip are the social origins and history of two pastimes: the picnic and the safari. While both are synonyms of leisure, travel and entertainment, they are also, traditionally speaking, foremost (neo)colonial, bourgeois activities. Class Trip seeks – not without humour – to invert the gaze through a lens that centres on a queering of gender, a critical class consciousness and a postcolonial approach to art production. Considering the site-specific nature of the LUXEMBOURG ART WEEK art fair, Class Trip works around the idea of economic voyeurism as a form of art consumption and encourages viewers to consider who is controlling the narrative of art production. Class Trip includes the work of six artists based in Berlin, Glasgow and Luxembourg whose pieces run the gamut from dark emotional and political morbidity to a bright, amusing extravaganza, incorporating both high-brow and low-brow aesthetics and meanings, the interpretation of which remains up to the viewer. In the framework of the exhibition Class Trip, curated by Casey Detrow, you are invited to think about the means of production in the actual economy. Choose one among 9 words and screen print it on a canvas tote bag. What will be the value of this new printed bag? Open workshop for adults, children and teenagers. Free contribution to the costs. In 1998, the fledgling itinerant biennial of contemporary art Manifesta 2 was held in Luxembourg. The bid for the event, which ‘put Luxembourg on the global map of contemporary art’ and allowed several local artists to attract international attention, was won thanks to a combination of favourable circumstances: the creation of Casino Luxembourg – Forum d’art contemporain in 1996, the success met by the Luxembourgish artist Bert Theis at the Venice Biennale in 1995 and, more generally, the upbeat mood generated by ‘Luxembourg, European Capital of Culture 1995’, not to forget the official go-ahead for the construction of a modern art museum, the future Mudam, in 1997. The conference retraces this key period in the country’s artistic development and its legacy, but also its challenges and limitations. Since 1999, Luxembourg has been organising exhibitions in its national pavilion at the Venice Biennale. In 2013, Catherine Lorent (b. 1977 in Munich, currently lives and works in Berlin) represented the Grand Duchy with Relegation, a project informed by notions of the Baroque and an expanded concept of art. Also following a multidisciplinary approach, Filip Markiewicz (b. 1980 in Esch/Alzette, lives and works in Luxembourg and Hamburg) presented Paradiso Lussemburgo in 2015. The two artists will share their respective experiences and discuss the evolution of their work since the Venice Biennale. Catherine Lorent is represented at LUXEMBOURG ART WEEK with Transitus Immobilis, a collaboration with Claudia Passeri and Serge Ecker, and at Polarraum by the German curator Enno Wallis. Filip Markiewicz is currently presenting his project Celebration Factory at Casino Luxembourg. Suzanne Cotter, the new director of Mudam Luxembourg, will be talking with Emma Lavigne, the director of Centre Pompidou-Metz, about the role of museums today and outline the challenges and opportunities they will be facing in the future. Like all professionals, artists need proper workspaces. But with the increasing strain on the housing market in Luxembourg, rental prices are soaring. This means that artists struggle to find decent workshops and are often forced to make do with a table in a shared flat or the cellar of their parents’ home. While local councils have been addressing the issue, their measures currently fail to meet the demand. And yet solutions exist. Sara Noel Costa de Araujo, architect and founder of studio SNCDA (Luxembourg/Brussels), will present her modular workshop, an autonomous and versatile structure. Trixi Weis, artist and president of the Luxembourg Association of Visual Artists (Association des artistes plasticiens du Luxembourg – AAPL), will discuss the current situation and the advances obtained by the AAPL on this sensitive issue.